When the Andalusian Sufi and philosopher Muhiddine Ibn Arabi decided to move to Damascus and spend the last 17 years of his life, he probably did not know that the place in which he was buried would hold his name forever. Ibn Arabi, of course, died in Damascus at the age of 75 on November 10, 1240. Ibn Arabi was not just a philosopher. He was a mystic, a poet, and one of the world’s most spiritual teachers. Known as al-Sheikh al-Akbar (the Greatest Master) he was born in 1165 into the Moorish culture of Andalusian Spain, the centre of an extraordinary flourishing and crossfertilization of Jewish, Christian and Islamic thought. He wrote over 350 works including the Fusûs al-Hikam, an exposition of the inner meaning of the wisdom of the prophets in the Judaic/ Christian/ Islamic line, and the Futûhât al-Makkiyya, a vast encyclopedia of spiritual knowledge which unites and distinguishes the three strands of tradition, reason and mystical insight. In his Diwân and Tarjumân al-Ashwâq he also wrote some of the finest poetry in the Arabic language. These extensive writings provide a beautiful exposition of the Unity of Being, the single and indivisible reality which simultaneously transcends and is manifested in all the images of the world. The Sheikh Muhiddin district in Damascus, named after the philosopher, is part of the historical neighborhood called al-Muhajireen, lying along the slopes of the Mount Qassiun, overlooking the Syrian capital. Al-Muhajireen was a magnet for emigrants coming to Damascus during the late 19th century, sought after for its favorable climate, and panoramic view of Damascus. Among the residents of the neighborhood were incoming Kurds, Circassians, and Albanians. By the early 20th century it became an attractive residential quarter as well, noted for the palace of the Ottoman Governor of Damascus, Nazem Pasha, which in 1943 was transformed into the Syrian Presidential Palace, hosting every Syrian leader from Shukri al-Quwatli to President Hafez al-Assad. Briefly in 1919-1920 it also served as the residence to Syria’s first—and last—monarch, King Faisal I. The Damascus middle class soon moved to al-Muhajreen, setting up impressive homes among the madaress (schools), Turkish baths, mosques, shrines, and historical tombs. To visit the Sheikh Muhiddin district, one needs to begin a pedestrian stroll from the Al-Afif Square (near the current French Embassy) at the eastern end of the Muhajireen neighborhood. That walk automatically takes tourists uphill, until reaching a white dome from which they have to turn right and walk along the paved narrow street historically known as the Street of Schools (Sharee al-Madaress). Thanks to the historical tombs that dot the district, dating back to the Ayyubid, Mamluk, and Ottoman eras, the street has managed to remarkably maintain its charm, despite the passing of centuries. Different architecture is noted on every street corner, along with different types of calligraphy, ornamentations and tiles. One of the first buildings that draws a visitor’s attention is a newly renovated one with a red dome, originally built back in 1298 and known as Al-Turbah Al-Takritia. Opposite to it is Darul-Hadith Al-Ashrafieh built in 1236 and Al-Madrassa Al-Murshidiyya. The most outstanding monument, however, is the Sheikh Muhiddin Mosque where the Sufi philosopher's shrine lies since the mid-1200s. The mosque was originally a humble place of worship, carrying a shrine with Ibn Arabi’s name within it. When the Ottoman Sultan Salim I conquered Damascus in 1516, he decided to renovate the mosque into its current shape and form. The mosque is an example of early Ottoman architecture with some local Damascene touches such as the basin in the middle of its courtyard. Beside the tomb of Ibn Arabi lies the empty tomb of Emir Abdul Qadir Al Jazaeri, the Algerian resistance leader who died in Damascus in 1883 and whose remains were transferred to Algeria after the Algerian independence from France in 1966. Try not to miss the wooden noria situated south of the mosque. Designed in the 13th century; the noria was part of the world's earliest water supply system to be driven by gears and hydropower. 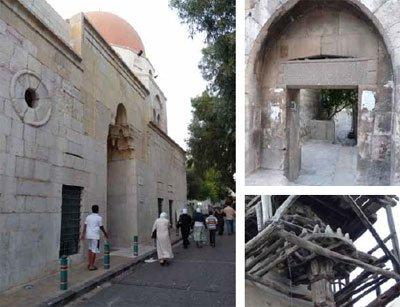 Although revered by Sufis and respected by historians across the world, Ibn Arabi’s shrine is one of the generally overlooked treasures of Damascus. Most tourists usually tend to visit the Umayyad Mosque and the Street Called Straight, or the ancient city of Palmyra, overpassing—unintentionally—the shrine of Ibn Arabi. Surrounding the shrine are a Damascene patisserie shop that prepares traditional giant Damascene cookies (Ajweh), an Oriental broom shop, and a very vibrant fruits and vegetables bazaar known as the Friday Market. A big portion of the historical neighborhood has been altered, sometimes beyond recognition, by wild urban planning, causing the Ibn Arabi neighborhood to lose some of its original charm and historical value. A considerable part of it, however, has been maintained and upgraded by several Syrian governments since 1920, serving as an example for generations to come who have followed Ibn Arabi’s teachings.